On Sunday afternoon, friends and fans gathered in London for a memorial service in honour of Lou Reed, Legendary frontman of the Velvet Underground, who passed away last week. “When the smack begins to flow, then I really don’t care anymore” a man recites in front of a packed chapel in north London choking back the tears. This is not your ordinary Sunday afternoon church service. 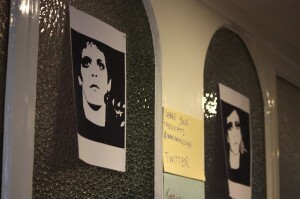 Instead it is a memorial for Lou Reed, held a week after the musician’s death. 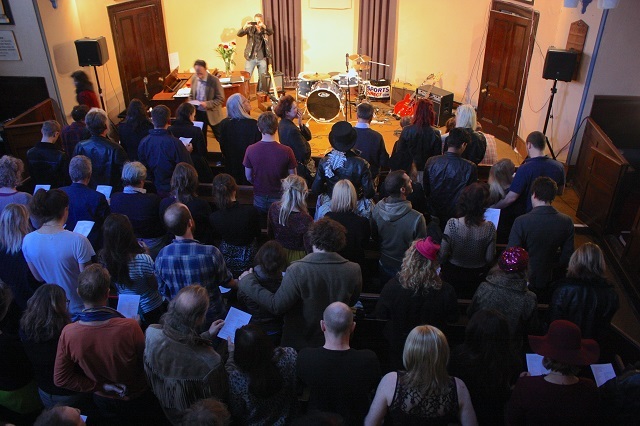 The hastily organised service – dubbed the Wake On The Wild Side – drew 160 people from across the country many of whom performed Lou Reed songs, recited his lyrics or shared memories of the Velvet Underground front man. Beginning with a heartfelt rendition of Perfect Day, sung by two sisters accompanied on the piano, and finishing two hours later with a rousing sing-along version of Sweet Jane, the Wake on the Wild Side was a surprisingly uplifting celebration of a remarkable man. Readings were interspersed with performances by bands and musicians with song sheets given out for audience members to sing along to Satellite of Love, Sunday Morning and Walk on the Wild Side. Performers who had known Lou Reed took to the stage. People who had worked with him or known him personally spoke from the floor. At one point meditation music made by Lou Reed was played and the congregation closed their eyes, concentrated on their breathing and meditated. There was something fittingly subversive listening Lou Reed’s gritty tales of drug pushers, junkies, drifters and prostitutes in a beautiful 18th century chapel whose walls had been decorated with Lou Reed posters, messages of remembrance. 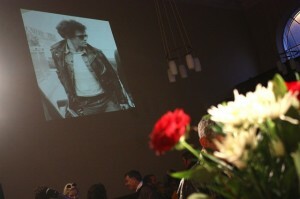 and 30ft images of the singer projected onto the chapel’s walls. It had all begun a week earlier with a tweet posted by the chapel’s atheist minister Andy Pakula which read: “Would anyone like to organise a rocking memorial service for Lou Reed? I’ll supply the north London church.” I responded to the Tweet we had met the next day to turn the idea into a reality. Places for the free event were booked-up in under 48 hours and Lou Reed fans ranging from young hipsters to aging punk-rockers came forward to help put the wake together. Some set-up the sound system and projector whilst others built the stage and decorated the chapel. A local pub offered to host an after party and a DJ turned up there with his decks and a seven hour playlist. Nick Cave sent his apologies and Salman Rushdie tweeted on Tuesday to say that he would not be able to attend as he was in New York. Stefan Simanowitz is a journalist and campaigner. He is Amnesty International's Media Manager for Europe, Turkey and the Balkans. He's on Twitter at @StefSimanowitz.